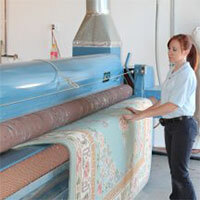 Dusting and Inspection: Most rugs are processed through our area rug dusting machine. 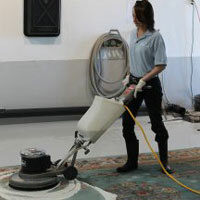 It is designed to remove as much loose dirt and dust as possible. The rugs are fed through a bed of tamping bars allowing the heavy soils to fall into the catch basin in the bottom, while at the same time having the large HEPA filter vacuum system remove the air-born dust. At this point, the rugs are ready for the washing process. (Please note that before any rugs are allowed to be washed they will go through a complete inspection). Washing: All rugs are washed separately to avoid cross contamination of soils and dyes. We have a variety of methods for cleaning area rugs, so it depends on the type of fiber or the age and condition of the rug that determines what process will be used to clean it. Most rugs can be processed using an industry standard method of saturation, application of a safe cleaning agent, gentle agitation with a rotary brush, rotary bonnet, or hand brushing and then power flushing using soft water in the process. 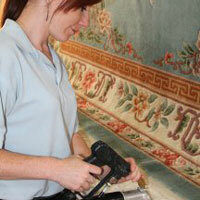 The Carpet Tender uses pre-softened cold water only! This helps ensure that there will be no “shrinkage” and that the fibers will dry to a new level of softness. Rinse: The rugs are then passed through our rinsing/wringing machine, which is designed to provide a thorough flush and removal of water. The rugs are then hung on our dry rack and hand brushed. Once these steps are completed, a second inspection is performed and documented. Drying: Most rugs are hung up on our dry rack system for two reasons: 1) to allow for a complete and quick drying; and 2) to help maintain the original shape until they dry. 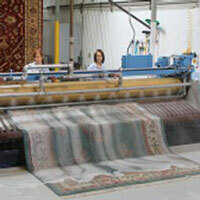 This drying process can take up to two days, depending on the size and thickness of the rugs. 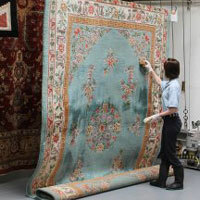 All rugs are tested with a moisture meter to insure that they are completely dry before they are removed from the rack. Fringe cleaning: After the rugs are dry, if they have fringes they will go through a separate process of hand cleaning to ensure that they are as clean as possible. 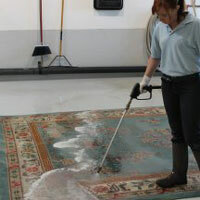 Rug Fiber Protection: As an optional service, we can apply a fiber protectant to help prevent future staining. In an emergency, it’s nice to know that you will have a little more time to clean it up before a permanent stain remains. Final Step: Upon the completion of all of the steps, the rugs are then hand-brushed or vacuumed to bring the fibers back to a soft, clean texture and are given a final documented inspection. Area Rug Pads: We offer a variety of different types of pads for different types of surfaces, that can be custom cut to fit your rug sizes. Rug pads have several purposes. They keep your rugs from moving or slipping around. They add a layer for sound absorption. They reduce the breakdown of the face fibers by absorbing the energy into the pad, extending the life of your rugs. No one else can clean and care for your fine area rugs, Oriental area rugs, Persian area rugs, Navajo rugs, Flokati rugs and Silk area rugs like The Carpet Tender because no one else has 31 years of experience like The Carpet Tender. State-of- the-art equipment combined with old world hand-finishing means your valuable oriental rugs, precious heirloom rugs, color-sensitive Navajo rugs, fugitive dyes (bleeders) and even delicate tapestries can take on a new life that you haven't seen in years. We have been serving Reno, Sparks, and Carson City since 1986. Our technicians are highly trained and knowledgeable, and you will not get a better value from anyone else in Northern Nevada. Unlike our competitors, we can handle room size rugs 13x30 or larger!